Long trail ride again Thursday night, and then today I took him out and put him back into a bit of work. We spent about 20 minutes at the walk, focusing on getting loose: bending, stretching, stepping up into the bit. All of it with mixed success. He was not thrilled to be on the bit (even a teensy bit) instead of walking the trails on a long rein. I did two trot sets of 5 minutes each. He didn’t feel great, though he evened out toward the end. I think what I’m feeling is mostly out-of-work stiffness, rather than unevenness. I picked up a canter very briefly, both directions, for just one or two 20m circles. Right felt fine. Left felt AWFUL but stiff and choppy awful, again. Sadly, he was breathing a teensy bit after the second canter, near the end of the ride, which tells me that I will have some work in building him up again. I did finally remember to take some pictures of his post-farrier foot, with a bit carved away to really make sure the abscess drained. I’m still flushing it after every ride to make sure it stays clean. I’ll try to get some better pictures outside next time I go down. 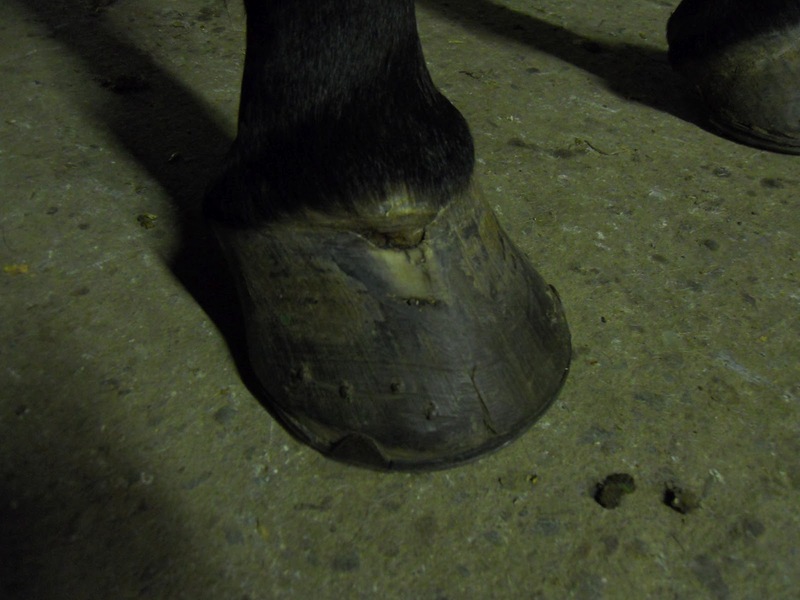 You can see the first abscess hole, and above it the new hoof growing down (thankfully! ), then below the second smaller abscess hole. Previous Post Back in the saddle again!